Before the days of the “big box” chain stores, Spruce Pine had many “mom and pop” grocery stores that served the area. There were also many smaller stores in almost every community. There was even a branch of the Dixie Home Store on Lower Street for several years that would become part of the Winn-Dixie chain, but Ingles was the first large chain store to come to Spruce Pine in the early 1970’s. Following were Lowes Foods, Whites, & Food Lion, then of course Wal-Mart. However, these “little boxes” offered personal service for decades to the people of the community. Four such examples are pictured here. Hickey’s Foodliner was located on Oak Avenue beside the current post office. 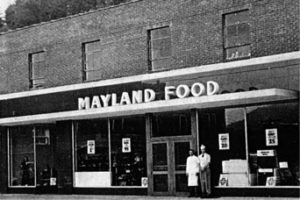 Mayland Food was in the middle of town across from the current Market on Oak, Mitchell Super Market was on, at that time, NC Hwy 226, now Summit Avenue, and Westall’s Market was located on, at that time, US Hwy 19E, across from what is now Harris Middle School. All four of these structures still stand but are used in different capacities. 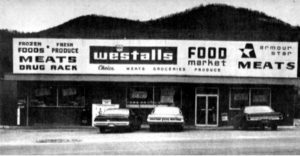 Westall’s Food Market was located on, at the time US Hwy 19E, across from present day Harris Middle School. 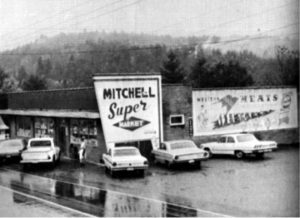 Mitchell Super Market was located on, at the time NC Hwy 226, now Summit Avenue. Hickey’s Supermarket was located beside the current Spruce Pine Post Office. Mayland Food was located on Upper Street, across from the current location of Market on Oak.